Zimbabwe’s quest for a new path under the auspices of the new dispensation and reengagement by Mnangagwa has vapoured into thin air faster than anyone could have imagined as the country is back again under the international spotlight. The November 2017 Euphoria has fast fizzled to Armageddonian despair. It raises the fears that Zimbabwe has quickly slided back into that era of gross human rights abuses, disappearance of people whose views are seen as politically incorrect, illegal policing of fellow citizens by violent party activists instead, one party state kind of situation, forced migration and displacement of opposition leaders and supporters. After a spirited and yet deceitful campaign portraying himself as a reformist, Mnangagwa had indeed managed to deceive Zimbabweans and the international community. But like the proverbial leopard that doesn’t change its spots, Mnangagwa has exposed his true colours. Since the November military coup in 2017, Mnangagwa has been trying so hard to portray the ‘good boy’ image, that of a reformer who is determined to drive Zimbabwe to the promised land of milk and honey. That approach was beginning to bear fruits with appearances at Davos and at least ‘favourable’ coverage from some once hostile international media outlets. Mugabe’s 37 years iron fist rule reduced a once beautiful nation into a pariah state with alarming human rights abuses, bad governance, a disappearance of the rule of law and rampant corruption by political elites. From where we stand, today, Zimbabwe finds herself, once again in a precarious situation with Mnangagwa’s rule under serious scrutiny, both locally and internationally as he seems to have failed to resist dipping from book of rules he and other leaders co-authored with Mugabe. The recent events in the Southern African country paint a gloomy picture, dashing hopes for a new dispensation and a different path that departs from Mugabe’s pariah days. I argue that Mnangagwa missed, rather a number of ‘golden opportunities’ to redeem himself from his horrendous past in Zimbabwe’s darkest history. The man simply failed the test, here is why? 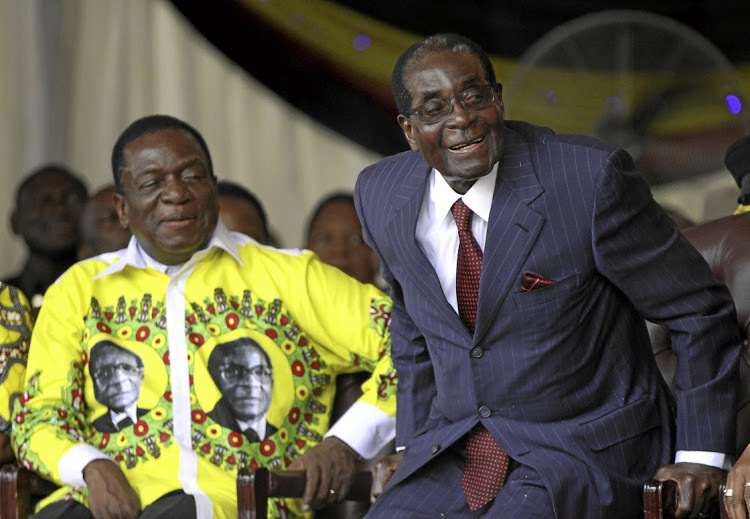 Firstly, after removing Mugabe through a military coup, Mnangagwa had an opportunity of emerging as a responsible leader ,’ to unite a divided underachieving impoverished nation that had been polarised by hate politics, violence and intolerance by Mugabe. In my opinion, Mnangagwa’s first port of call should have been to call for an all-inclusive national dialogue that would initiate discussions on the country’s polarised political environment, the economy, national peace and reconciliation programme, and re-engagements efforts after the pariah years of Mugabe’s misrule. The national dialogue process’ thrust was to discuss and lay out transitional mechanisms whose sole purpose was to deal with electoral reforms with particular time-frames leading to a national election. Secondly, just a day after the election was conducted and before the release of results of a generally peaceful election were announced Mnangagwa, squandered another opportunity by unleashing soldiers on the streets of Harare resulting in the deaths of 6 innocent civilians. Even with a simmering dispute around the results, most observer missions, particularly the African brothers were preparing to turn a blind eye on the chicanery around the results and endorse the election. However as the African brothers were still chuckling behind the scenes the demon in him (Mnangagwa) suddenly flared up and he deployed the army to kill innocent civilians who were protesting on the streets of Harare. With a likely endorsement from his erstwhile African brothers, there was really no need for Mnangagwa to deploy the army as this exposed him and put his leadership under the spotlight. The 1st of August protest should have been dealt with differently. I argued during that time, Mnangagwa had literally gotten away with murder (rigging) had he not unleashed trigger happy soldiers who spoiled the party for him by killing civilians. As the shootings happened, Mnangagwa did not come out in the open to take responsibility that he had indeed deployed the army leaving many to speculate that it was his deputy Chiwenga. It did not end there, Mnangagwa proceeded to appoint a commission of inquiry led by former South African president, Kgalema Mothlante. I argue that there was insincerity around the setting up of the commission. If the truth be told, the setting up of the commission was meant to be a Public Relations (PR) exercise to ‘please’ the international community, in particular the British and Westerners. Equally, the commission’s terms of reference were quite clear that it appeared a witch hunting exercise to blame the MDC Alliance for having caused the chaos. This then brings me to my third point, of yet another missed opportunity by Mnangagwa, in that in the first instance he should have “consulted” all the stakeholders on the composition and terms of reference for the commission. Rather than the backlash he got after appointing some individuals with questionable backgrounds to be part of the commission. Consequently, despite the controversies around the composition of the commissioners, the commission’s recommendations also presented an (fourth) opportunity around implementation. In hindsight the fact that the recommendations are still to be implemented and there seems to be no desire to do so. This, raises fears that it was just a window dressing exercise and this has come out clearly from his utterances in Mwenezi. Despite, Mnangagwa’s outright denial that he deployed soldiers on the 1st of August 2018 and blaming the opposition for causing the violence that happened during the shut-down in January 2019, his shocking utterances in Mwenezi and his interview on France 24 have exposed him as the architect of the whole saga. Mnangagwa boasted: “We should be on the lookout as our enemies are not resting, but ensure our eyes are always wide open. We will crush our enemies, and they are being crushed.” It is now quite evident, beyond any figment of doubt that he was well aware of the goings on and all this is part of a wider crackdown on the main opposition, the MDC Alliance and the civil society. To sum it all, the unfolding events in Zimbabwe show that ZANU PF is in now back to its default mode of violence. Essentially, the utterances by Mnangagwa in Mwenezi are a declaration that, firstly ZANU PF is politicking about the new dispensation, secondly they are not prepared for any reforms before the next election, thirdly there is going to be more clampdown on activists, with raids on CSOs, fourthly rural areas are once again declared no go areas for the main opposition and civil society. In light of these, I also wish to highlight that the proposed meeting by the First Lady Auxillia Mnangagwa to meet with the wives of traditional leaders, is worrisome as it might be part of a broader strategy by ZANU PF to close the rural areas in preparation for the next election in 2023. Therefore, as this is happening, Zimbabweans should not look for any miracle in the revival of the economy. The structural economic implications of the Mnangagwa administration are dire; there is no hope. The levels of poverty in Zimbabwe will worsen, income has been eroded, inflation is galloping out of control, industrial productivity is slowing down (Miners scaling down), prices are off into the sky, investors are giving Zimbabwe a wide berth and yet the party state has increased extractive taxes. Notwithstanding Zimbabwe's political elites getting 'solidarity' from the region the contemporary complex concoction of widening factional fights in the political elite ranks; the widespread political polarity and the on setting economic meltdown will slowly but surely blow Zimbabwe into another vortex of poverty, disease and political conflict. In conclusion, I argue that by inciting violence, the outcomes so far cement Mnangagwa’s continued trajectory on Mugabe’s type of politics of a vampire state. The vampire state entails the Mugabe style of politics: of criminalising some fellow citizens; degrees in violence; plunder of national assets; anti-west rhetoric; nationalistic-military authoritarianism; endless foreign trips to despotic nations, like Russia, Belarus and China in search of elusive alternative capital; and finally living in opulence and extravagancy whilst the nation wallows in disasters and poverty. In essence, Mnangagwa is aligning his regime with the eastern bloc mainly to achieve, one key objective; to seek sanctuary from the likely censure from the West, given his now resort to dictatorship, as warned by his spokesperson, George Charamba, that the January 2019 military crackdown was a “ foretaste of things to come”. It’s back to Armageddon! Go well, Samanyanga! Fambai zvakanaka! You have left us with troubled hearts and souls. We will remember you day and night as we mourn and simultaneously celebrate a great life you lived, not only for yourself, but for the community at large. It’s also a painful fact that you are irreplaceable. I find an obituary as one of the hardest assignments anyone can be tasked to do. It’s always an agonising experience, a dark patch no one would want to stay in for long. While one mourns, they are also trying to capture the career highlights of the departed gallant son of the soil, which they want to share with the world in the heat of the moment. This is the ordeal that I find myself in. I am trying to turn into two typed pages, a life of 66 music albums spanning five decades and a decent global influence. Where do I start from on the life of Oliver “Tuku” Mtukudzi? What can I say about him in two pages without short-changing his true account? The best narrative I can say about Tuku’s history involves his alter-ego in the music industry, Thomas Mapfumo, better known by his totem Mukanya. The two were undoubtedly the best super stars that Zimbabwe ever had. They would meet, part ways, perform together and rejoin as they kept pumping out great music to soothe Zimbabwe’s ears. ​As an example of the way life was in Tuku and Mukanya’s world, it had been 14 long years of absence from Zimbabwe. Mukanya missed home and the fans at home also missed him. He had to be home by Independence Day in 2018. The dates were set for his welcome back concert. While the supporting acts had not been finalised, discussions were underway. We made sure to pick only the best supporting acts for the welcome back gig. We set up a meeting in Johannesburg, South Africa. I was the face of Chimurenga Music Company (CMC), while promotion company Entertainment Republic was represented by Max Mugaba and Tendai Jones. When I arrived at the venue of the rendez vous, I was shocked to meet two young men said to be the ones organising Mukanya’s welcome back gig. What a historic feat! For years, attempts had been made by various music promoters to bring Mukanya to perform at home, but to no avail. At one point, flamboyant businessman Phillip Chiyangwa was quoted by one newspaper declaring that he was bringing the legendary artiste back to Zimbabwe, but that went nowhere. Even former Deputy Prime Minister Arthur Mutambara tried to cajole Mukanya, but his efforts did not yield results. This was the best news ever and I couldn’t wait to break it. For me, it had always been a dream to have Mukanya and Tuku share the stage and even put up a song together as the two remaining legends (still active musicians). These were two musicians that met four decades ago at Chogugudza’s studio in Mbare. From there, they were in the same band the Wagon Wheels Band for a short stint. Later, each of them would embark on solo careers. It was at Chogugudza’s studio that the friendship began and it blossomed forever. The years to follow were characterised by tension, with various imagined or manufactured theatrics and public opinions of fictitious alleged bad blood between the two. Some even tried comparing the two, as they fought hard to pick the better one. Those days, jokes were made about two of their songs, Mukanya’s Shiri Yakanaka and Tuku’s Chirimupoto. Before that, Mukanya had sung Madhebhura, while Tuku had offered Vanobvongodza Muto. There were also narratives that Mukanya had mocked Tuku over the song Chirimupoto as having lacked substance and creativity. But Mukanya denied ever having made such comments and insisted people had ulterior motives to divide him and his long time. Consequently, some music fans, instead, trashed Mukanya’s Shiri Yakanaka, which they described as his worst composition, which they said was so divorced from his Chimurenga genre due to its lack of depth and desultoriness. However, there would never be any public response or comments attributed to Tuku regarding Mukanya’s alleged words. They let the fans go on in their bliss as the music kept pumping. Despite all the gauzy accusations, Tuku continued reaching out to Mukanya, whom he regarded as his real elder brother in trade. That was despite the random concern from Mukanya that Tuku had bowed to Zanu PF, for instance on his performance at the controversial million man march. Also, despite Mukanya’s several interviews expressing concerns on Tuku’s loyalty to Zanu PF, the latter remained quiet, instead wishing Mukanya was home for support. Surprisingly, Mukanya was never labelled MDC despite some open association with some MDC politicians. In 2015, one Zanu PF legislator attended Mukanya’s show as a patron of CMC show in South Africa. The patron was even accused by then First Lady Grace Mugabe of being a traitor. But still, Tuku had no time to make comments or judge his brother. Instead, he opted to pretend to know no political party as he clearly understood the environment that he was working under. Any proven acts of disobedience to the government could have cost him and his career. Many other stories of bad blood between the two dominated the media. I do recall one journalist sending me questions for Mukanya to respond, asking him if, indeed, it was true that relations between the two were bad. Mukanya laughed it off and alluded in vernacular “vanhu ava vanoda kutirwisanisa, Oliver ihama yangu takabva kure” (people always want to create fights between us, Oliver is my friend and we came a long way). 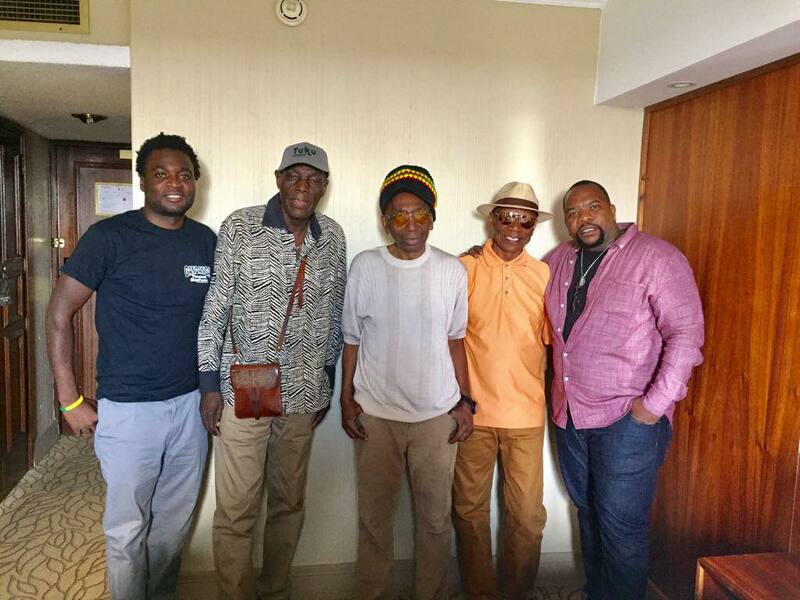 In many other interactions, Mukanya would always refer to the day he met Tuku at Sekuru Chogugudza’s recording studio, and how they joined hands as part of the Wagon Wheels. Mukanya recollected that the first time he met Tuku, he was singing in English, but advised him to use the vernacular language. “He had his song, Green for Go and Red for Stop, and I then gave him one of my songs Tamba Hako Marujata, a folk song I had done in my own way, and it later became a hit with the title Rova Ngoma Mutavara,” Mukanya quipped on one of my discussions with him. It’s also interesting to note that Tuku would meet his first wife Melody Murape at Thomas Mapfumo’s show in Highfield in 1977. This brief account of events are a testimony that the two came a long way. So, as we planned for the Big Bira. I was excited that finally, the two legends were going to collaborate on the same stage. A trip to Zimbabwe was then planned for me for the following day, February 9, 2018. I was to convene a press conference announcing the dates and the Big Bira programme. 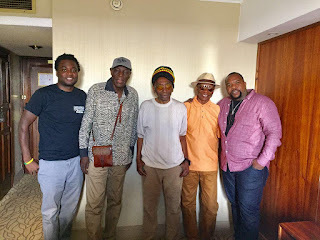 It was at this event that Tuku’s manager Walter Wanyanya and I agreed to organise a visit by Mukanya and his family to Tuku’s Pakare Paye Arts Centre in Norton upon his arrival for the Big Bira. Wanyanya also confided in me that Tuku had cancelled his scheduled tour outside Zimbabwe to be part of the Big Bira. On the mid-morning of April 24, we landed Pakare Paye. The trip was important in two aspects: firstly, after my discussion with the band manager Austin Sibanda and CMC lawyer Tapiwa Kapurura, we planned to have Mukanya add his voice on dendera musician Sulumani Chimbetu’s song Dzokai Mukanya; second, we also wanted to take the opportunity for Mukanya and Tuku to do a collaboration together. This was after Sibanda had already agreed with Wanyanya. The said collaboration was reaffirmed by Sibanda and Mukanya himself, during a press conference held on April 23 at Crowne Plaza Hotel in the capital. So we arrived at Pakare Paye slightly earlier than Sulu, who together with his entourage arrived 30 minutes later. We briefed Mukanya that all was set and the studio was ready for the much-hyped and publicised collaboration. Sadly, on the last minute, it never materialised. Mukanya had suddenly been attacked by a terrible bout of flu which affected his voice. He even feared for his upcoming performance. A physician was called in fast. Mukanya then assured Sulu that he could probably listen to the track afterwards before adding his voice. Sulu would then have to send the track to Mukanya’s producer in Oregon in the United States to facilitate the collaboration. The mishap did not affect their (Mukanya and Sulu) relationship. We all left the studio for lunch to be hosted by Tuku at one of the restaurants at Pakare Paye. Mukanya’s younger brother William Mapfumo, Sibanda the band manager, Garry Tight, Sulu and the late Edmos Pazvakavambwa. There, we were treated to first-class four course meals as we talked and laughed like we were having a farewell party. I captured the moments as Tuku and Mukanya went down memory lane talking about their experiences at Sekuru Chogugudza’s studios in Mbare in the early ’70s. I also got the opportunity to ask the two about the mystery behind the $7 story which Tuku was paid after a performance at one of the night clubs back then in the ’70s. They both laughed it off, with Tuku saying: “Bhule chimbomira izvozvo, husiku ihwohwo takafara.” Mukanya was even surprised and asked me who had told me that story. No answer was given to that question that night, but only laughters. As Mukanya was in the studio with Sulu, Pakare Paye marketing manager Watson Chidzomba invited me and Sibanda into his offices. Chidzomba warmly welcomed us and told us that Tuku was excited ahead of the Big Bira. “I will tell you that he has been rehearsing every day and he can’t wait for the day,” Chidzomba quipped. His words were quite emotional, and it showed how Tuku valued his relationship with Mukanya. This was a man who had cancelled his tour for Mukanya. In Harare at the Glamis Arena, Tuku would join hands with Mukanya on stage as an act of solidarity. That night, Tuku poured out his soul and love as he danced in good cheer. Little did everyone know that it was a farewell dance driven by God to prove their life long camaraderie? But as they say, “procrastination is the thief of time”, we procrastinated and, sadly, Tuku passed on before we could visit again and do the historic collaboration. In his career, Tuku played almost everything, cutting across from country, mbaqanga, reggae, sungura, rock n roll, gospel, pop, Zimdancehall to urban grooves just to mention but a few. He was a versatile all-weather and all-style musician, who would sing with everyone and sing everything and anything. This is what made Tuku endear with everyone, every generation, class, religion, every tribe, every nationality and, indeed, he became a giant in Africa and the world over. Just like Mukanya, Tuku was accommodative and full of humour. Tuku had a love-and-hate relationship with Zanu PF, his compositions were subtle, it was not easy to understand his lyrics. Songs like Bvuma (reference to then President Robert Mugabe’s old age), Ngoromera (song against political violence), Mhopo Pamusana and Tozeza Baba, among other compositions, were all punches directed at the ruling class, but they never got to be understood. That was a true mark of an artiste, he left it to the listeners to analyse and interpret. Tuku was a powerful musician who sang consistent themes packed with lethal punches. His songs were subject to a thousand translations, but in essence, he was hitting hard on the regime. A classic example was Tozeza Baba, which many would interpret as a mark of the effects of domestic violence, and yet it was a direct reference to Mugabe’s misrule. He acted like a drunken father who made life horrible for his Zimbabwean family. Such songs exonerated Tuku from the regime, as they made him appear like just a social commentator, yet he attacked them in their midst. Tuku had a gift of singing political comments laced with social commentary. He would, at random, cunningly pass adverse comments on the regime. Other songs likeNhava Izere Mhepo (the bag is full of air, it’s empty) was sang in reference to Zanu PF’s empty promises and failure to tap foreign aid from supposed friends as people suffered. While people celebrated Tuku as a non-political commentator by singing Nhava Izere Mhepo, Mukanya opted to be militaristic with no-holds-barred songs likeMamvemve (country in tatters). The story of the two simply reminds us of the various talents the two artistes carried. Each went the other way, but would meet as Tuku sang Pota neko tisangane tiwadzane sembariro. He was a man of the people. He sang to entertain and inspire. Today, the world mourns. A son has been lost. We cry. Tears may dry, but memories will remain fresh. The elephant, Samanyanga, has left us with a solid history to be talked about for generations to come. You used your voice and guitar to change the world. Both enemy and friend now turn swords into ploughshares as they ponder on your cryptic lyrics. As you also sang with James Chimombe “Ini newe ngatiimbe”, you unified us all through your creativity and powerful use of words. Your music taught us love and laughter, care and concern. You were, you are and shall always be our hero and our senior superstar. Rest is peace son of the soil.Chizororai zvenyu muKorekore. Tasvitsa manja pachiKorekore. Pangu pese ndasakura ndazunza! Fambai mushe Nzou. 31 July…AN END OF AN ERA? blevava@2011. Simple theme. Theme images by Gaussian_Blur. Powered by Blogger.